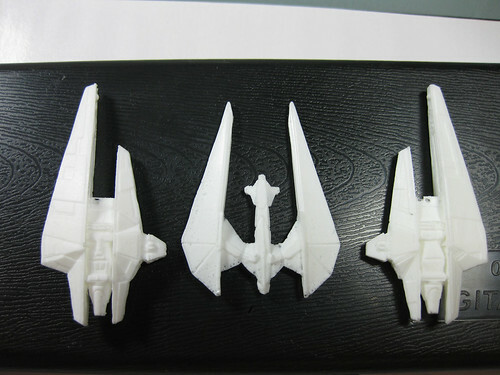 After I picked this ship I had to make molds of the Thentus and the Var’Nic. I did the Var’Nic first with no problems, with the Thentus though I did have some issues. Before I took the mold I added some Evergreen Styrene strips to the underside in some of the really thin areas. I was a little worried about how strong the plastic resin would be, especially as it does not have the same flexibility as white metal. When I was making the mold I ran into a problem, the scale I was using to measure out the two part RTV solution sucked. Bascially if you added material slowly enough it wouldn’t register, that and the smallest measurement on the scale was one gram, I made one half of the mold with too little of the catalyst. I am sure I could re-do that half of the mold but I am waiting on a new better scale before I try. Interestingly enough the mold works, but I get very strange flash on the model, it is almost hairy, and takes quite a bit of work to clean off. Not really a big deal though as with this model the stars are the two Var’Nics. So I cast the models, cleaned the flash off of them and set to work. The first step was to sand down the Var’Nics where they would meet and get the angle I wanted, and then I drilled out a hole in each one to pin them together. They were then superglued together. 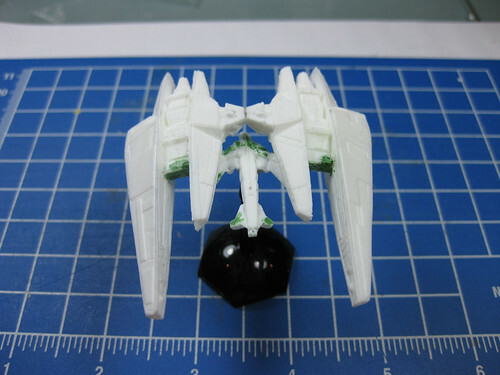 I then cut off the two sides of the Thentus, and started filling the bubbles that are visible in some of the photos with Squadron greenstuff. The Thentus had a large number of bubbles and flash, mainly my own fault, but it took some work to get ready. I then sanded the Thentus so that it would meet the two Var’Nics and then superglued it in place. The next step was to secure the barrel clasp to the bottom for the base to attach to. I use the same basic method that Star Ranger uses over at http://www.star-ranger.com/Home.htm, the only difference is I use the original post instead of replacing it. To strengthen the post I use a drill press to drill a small hole about a quarter the way down, that I then fit a brass rod in that also inserts into the bottom of the barrel clasp. Both ends of the clasp are held in place with epoxy putty, I use 90 second stuff I get from the local hardware store, while adding the barrel clasp to the ship I also used some left over epoxy to strengthen the connection between the Thentus and the Var’Nics. I will probably do a tutorial on my version of Star Rangers basing method one day, just need to remember to take photos. In the above photo you can see where I thickened the Thentus, there is a cross near the front, and two pieces either side of the barrel clasp. Incidentally, once I tried using the barrel clasp method, I was so taken with it I ordered a few hundred of them off of eBay. I was worried about getting different sizes which would stop me from being able to interchange the bases, so I bought what I hope will be enough to last me. So there it is ready to be primed, which I forgot to take a photo after, but it is just the same only all black, so you will need to use your imagination. I will go through my painting next post. Feel free to leave a comment if you have any questions, or just want to leave a message. 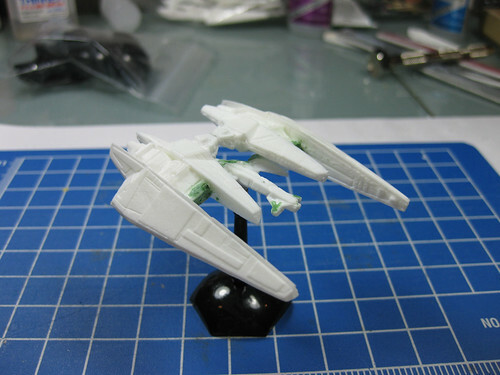 I have always had a thing for spaceship miniatures, and even more so when it comes to any Narn ship from Babylon 5. I have been slowly painting up my collection and adding pieces when I can get them off of ebay. I regularly look for inspiration for my painting from images taken from the show to other blogs and websites, however a recent perusal ended with me being enthralled by a CG image I saw on DeviantArt, as seen below. 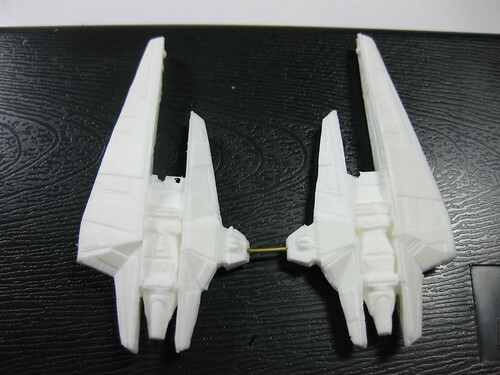 It is two Var’Nic cruisers connected by a generic bridge section. As soon as I saw it I knew I needed to create it. I just so happened to have a Var’Nic and a Thentus cruiser that I had yet to paint. 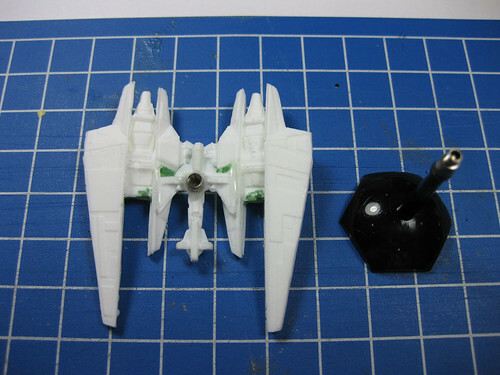 Seeing as these miniatures are no longer in production I decided to make resin copies of them to work with. 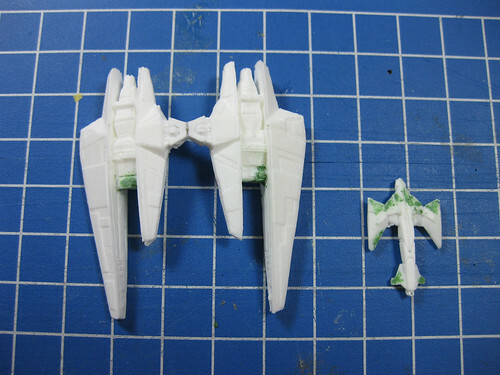 Below are the three ships, getting ready to go under the knife. As you can see they are not the best casts, but I am still learning. Next you can see it all put together, ready for priming. And jumping ahead a whole tonne of work, the finished product. I really enjoyed building and painting this mini. I think it is the fastest I have every built, primed, and finished anything. Usually I seem to have months between each of those steps. I had been thinking about starting a blog to share how I paint my miniatures for quite a while, and today I finally sat down and did it. 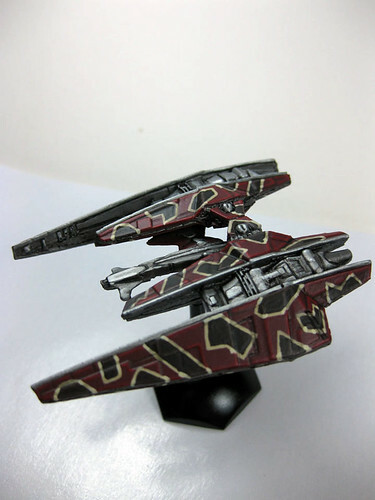 What really helped me decide to do it is my current project, I am working on a custom Narn ship from the Babylon 5 universe inspired by this image from DeviantArt http://amras-arfeiniel.deviantart.com/gallery/#/d2f8nnp. It is two Var’Nic ships and the central part of a Thentus crusier. I am just working on the second to last layer of highlights, so I should have it posted here real soon. While there are a large number of boxes on the shelves that I can’t wait to jump into.